FOR THIS month's entry, we put forth a new first in the Stroke of Genius catalog: a shot that's older than the shooter. At Grady Mathews' 1992 Legends of One-Pocket event, a 19-year-old Shannon Daulton (who looked maybe 16) blasted his way into the final, where he faced Steve Mizerak. "The Cannon," besides proving his nickname was well earned, shocked the packed house by topping veteran after veteran. But in the final, a race to 5, Daulton had his work cut out for him after dropping the first three games. 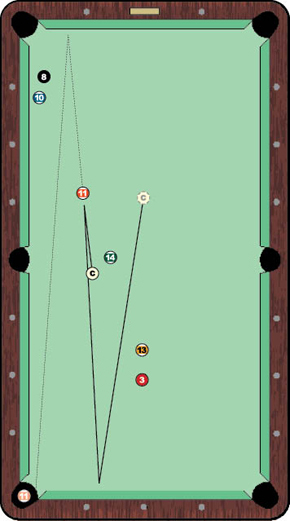 He battled back to within a rack at 3-2, when he approached the table shown in the diagram. Trailing in the game, five balls to four, Daulton, who was shooting at the bottom left pocket, had plenty of options. Accu-Stats commentators Billy Incardona and Jimmy Fusco suspected the kid might bank the 3 ball and spin out for position on the 13. But Johnny Ervolino suspected the 11 ball might be the best bet. Johnny was right, but nobody knew how Daulton would play the lengthy bank. Instead of drawing the cue ball back a few inches for another bank on the 13 or 3, the brash teenager had bigger plans. Daulton instead pulled the cue ball straight back, off the bottom rail and five diamonds out into the center of the table. The shot left the commentators in stunned silence, while the equally awed crowd erupted in hoots and hollers as the cue ball crawled into the position shown. Daulton ran out this rack to tie the match on his way to a 5-4 upset victory, a win that caught everyone off guard. "That one had to be one of the biggest shockers to anyone in the world of pool, myself included," Daulton said.